First of all I would like to announce that I have acquired my french baccalaureate with a merit!!!! I am very pleased! 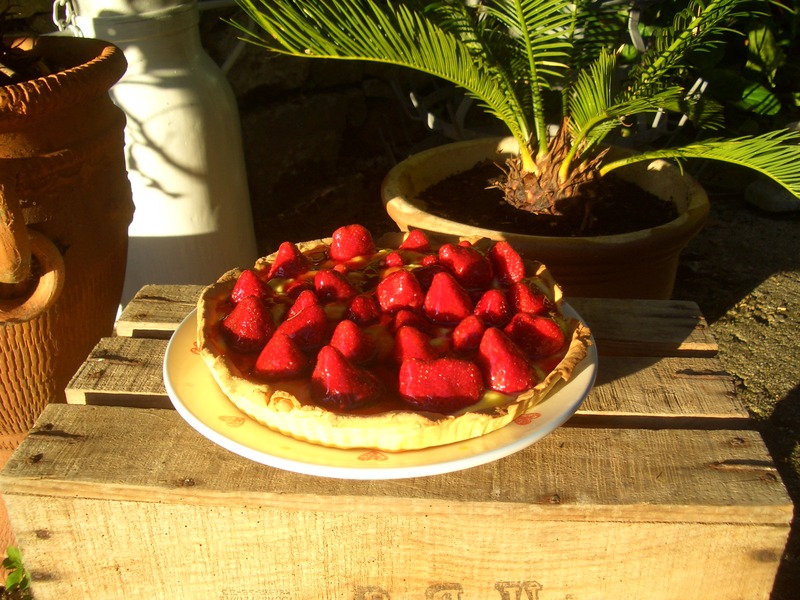 I shall make something to celebrate but in the mean time let me show you the recipe for this lovely strawberry tart. It’s the beginning of summer now and one of the best seasonal fruits of course are strawberries, everybody loves them and they look so nice. It was a beautiful day so I decided to make a tart, pastry and all. Be warned, this takes quite a long time to make, something I overlooked in my cooking frenzy. Overall it was nice, I have had better but I was still so proud of it because I made it. 1. First of all you need to make the pastry. Sift the flour into a food processor and cut the cold butter into small pieces on top of it. Process for about 20 – 30 seconds, then add the tablespoon of icing sugar and the egg yolks. If the paste is crumbly add a little bit of water. When the mixture has turned into a single ball, wrap it in clingfilm and put it in the fridge for at least an hour. 2. When the chilling is done, cover your work surface with some flour and get rolling! Once the pastry is rolled to your satisfaction, lie it in a greased tin, leave it in the fridge for at least 30 mins. 3. To bake blind the pastry, preheat the oven to 200°C/400°F/Gas 6. Place some greaseproof paper over the pastry and pour on the dried beans.cook for 10 – 15 mins, remove the beans, and return it to the oven for another 10 – 15 mins until golden and cooked. Leave to cool. 4. For the crème pâtissèire scald the milk, with the vanilla pod and it’s scraped out seeds. 5. Whisk the egg yolks, sugar and cornflour together in a bowl, then pour the hot milk on them and continue whisking. 6. Remove the vanilla pod and return the mixture to the saucepan, stir over a gentle heat until thickened. Turn into a bowl and cool, whisking every so often. 7. When cold, scrape into the pastry case with a rubber spatula. Turn the tart out onto a plate/bread board. 8. Now for the main, and most delicious, ingredient! 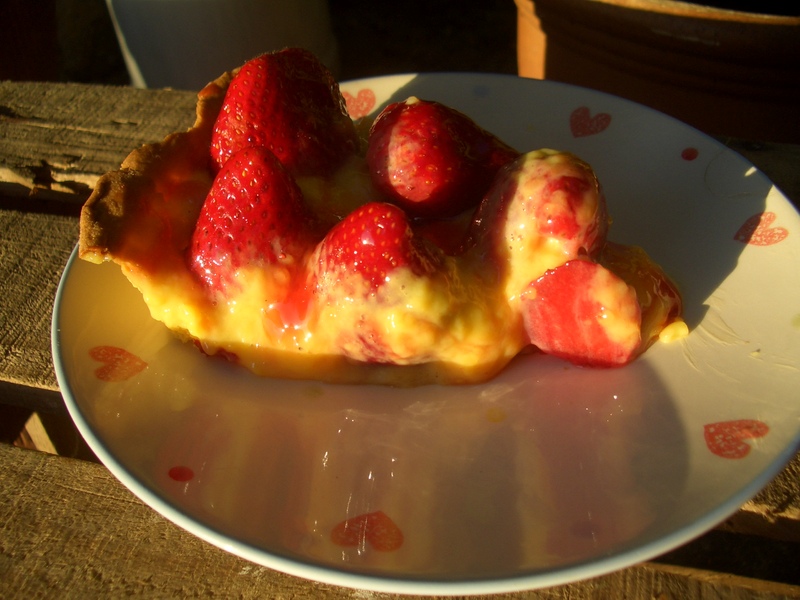 Hull the strawberries and, starting at the edge of the tart, stick them upright in the crème pâtissière in a circle and work your way in, the strawberries getting smaller and smaller as you go. 9. Melt the redcurrant jelly with a tablespoon of water, then brush it liberally over the strawberries and the custardy gaps. 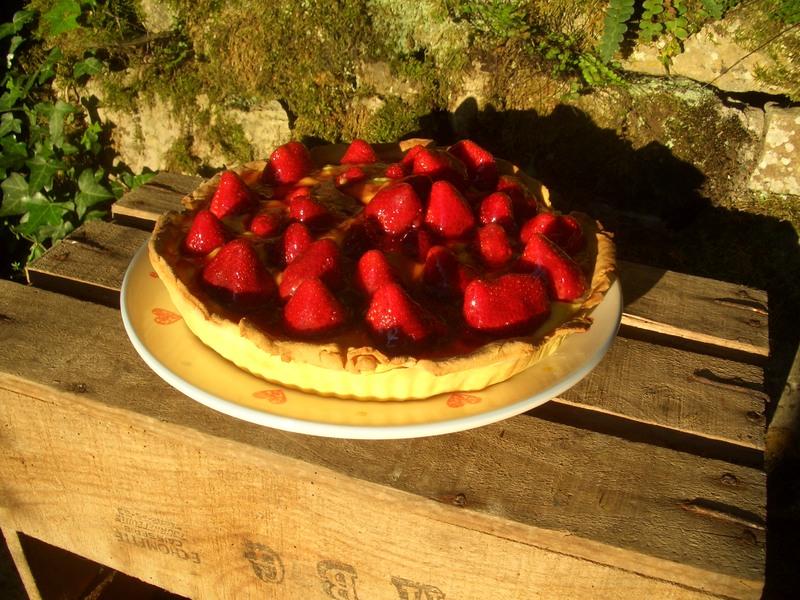 Posted in Baking, Cooking, Food, Uncategorized and tagged redcurrant jelly, strawberries, Strawberry tart, summer, sweet pastry, Tamasin Day-Lewis, tart. Bookmark the permalink.